CONGRATULATIONS! You’ve taken the first step towards your next career adventure by making this appointment with a Certified Resume Writer! ☑ ASSESS your professional background, targeted career goals: job ads and/or company profiles. ☑ DISCUSS how Di4Resume® can establish a POWERFUL executive brand that will increase your visibility and online presence. ☑ REVIEW your resume, cover letter, and LinkedIn profile, strategically analyzing how Di4Resume® can enhance your career portfolio to boost your competitive edge. ☑ EVALUATE the ATS-compatibility of your current resume documents and formatting Applicant Tracking System (ATS) resumes. The digital revolution has taken over talent sourcing and changed how employers respond to “resume tsunamis”. According to Software Advice, there are over 293 ATS on the market today. 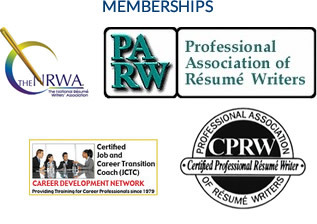 ☑ SHARE samples of my work product, and discuss modern resume formatting & design. Every resume is custom-designed in accordance with each client’s career background & targeted goals — no templates are used! ☑ ANSWER any questions you may have regarding my overall business process, pricing, availability and project timeframe. ☑ REMAIN available to work “one-on-one” with you to custom-design your Executive Career Portfolio and Presentation of Qualifications. Copyright © 2019 - Executive Resume, LLC All Rights Reserved. Client recognizes that Executive Resume, LLC (hereinafter “DI4RESUME”) is a small, American-based writing practice that offers a “boutique-style” service (documentation prepared in US/Canadian style) to both nationwide & international clientele. DI4RESUME does not locate jobs, give technology or legal advice since we are not a Recruiting, IT or Law Firm. Client realizes that this project is based on Client’s involvement and equal participation will be required for project success. Client agrees that by making payment to DI4RESUME constitutes acceptance of this Terms of Service and understands that project is non-transferrable. Client hereby agrees that any inaccurate, incorrect, or misleading information in the resume or other worksheets/materials is not our responsibility & that he/she had ample opportunity to review all documentation & approve the entire content prior to delivery and/or reproduction. DI4RESUME does not take any legal responsibility for the outcome of any projects we undertake. Client understands that writing is a creative personalized service, and as such, payment is nonrefundable and cannot be canceled. Client acknowledges that the project price takes into account DI4RESUME’s expertise, skill and time including (1) Client intake time, such as e-mails back and forth concerning the project, (2) content writing, (3) typesetting/design/layout, and (4) proofreading and editing. Writing projects include One (1) revision/set of edits. Delivery of Proof #1 is generally 10-15 business days from receipt of payment, completed questionnaires, and other information. Proof #1 will be crafted based on the original “Scope of Work” and initial Pre-Resume strategy session. After delivery of Proof #1, Client has up to 7 days to (a) review the draft; & (b) accept a (30-minute) Post-Resume strategy session to discuss required changes. Changes will be returned within 5-7 business days. Failure or silence by Client to (a) approve or request Proof #1 edits/revisions (by phone or email) within the 7-day time limit; or (b) be available for the strategy session call constitutes acceptance and finalization of the work product. Any additional edits or consulting time beyond the 7 days will be billable at our standard hourly rate of $250 per hour. Once the edited, Final Draft is presented to Client for review, it is for purposes of final proofreading within 3 business days—Client will send an email to DI4RESUME providing any minor edits required to finalize the resume. Final proofreading is the responsibility of the Client & upon acceptance of the final project, the Client confirms 100% satisfaction & is solely responsible for the accuracy, usage & results of project work. DI4RESUME provides resume formats in both Word and PDF versions. Projects submitted electronically to Client immediately becomes property (& responsibility) of said Client. DI4RESUME is not liable for document/file compatibility issues or usage of electronic material provided. Completion of work is subject to unforeseen circumstances such as electrical or mechanical failures, writer’s health or family emergencies, and acts of God (earthquakes, etc). DI4RESUME’s liability is limited to completion of work or refund of total amount paid.